CoCoRaHS (pronounced KO-ko-rozz) is an acronym for the Community Collaborative Rain, Hail and Snow Network. CoCoRaHS is a unique, non-profit, community-based network of volunteers of all ages and backgrounds working together to measure and map precipitation (rain, hail and snow). The National Oceanic and Atmospheric Administration (NOAA) and the National Science Foundation (NSF) are major sponsors of CoCoRaHS. Other organizations have contributed either financially, and/or with supplies and equipment. CoCoRaHS has over 20,000 volunteer observers in all 50 U.S. states, Puerto Rico, the U.S. Virgin Islands, Canada and the Bahamas. Of the network’s 333 coordinators, 254 work closely with NOAA. By using low-cost measurement tools, stressing training and education, and utilizing an interactive website and apps, the aim is to provide the highest quality data for natural resource, education and research applications. Why is there so much interest in rain, hail and snow? Precipitation is essential for life. It varies greatly with topography, storm type and season. It really is true that it may pour on one side of the street and be dry on the other. A portion of a field may be pounded by hail while others nearby receive no damage. Snowfall may pile up in one neighborhood and only dust another. Rain, hail and snow are fairly easy to measure, and the data collected are very important. CoCoRaHS is used by a wide variety of organizations and individuals. The National Weather Service, other meteorologists, hydrologists, emergency managers, city utilities (water supply, water conservation, storm water), insurance adjusters, USDA, engineers, mosquito control, ranchers and farmers, outdoor & recreation interests, teachers, students, and neighbors in the community are just some examples of those who visit their Web site and use the data. What does a volunteer observer do? Each time a rain, hail or snow storm crosses your area, volunteers take measurements of precipitation from as many locations as possible. These precipitation reports are then recorded online at www.cocorahs.org or through CoCoRaHS’ app. The data are then displayed and organized for many of their end users to analyze and apply to daily situations ranging from water resource analysis and severe storm warnings to neighbors comparing how much rain fell in their backyards. It’s easy to join, takes only five minutes a day and is a fun way to learn about weather. People of all ages can help. The only requirements are an enthusiasm for watching and reporting weather conditions and a desire to learn more about how weather can affect and impact our lives. Complimentary training is provided to help you become an effective weather observer. Check out your state page for a list of current training sessions in your local area. If none are taking place at the current time, CoCoRaHS has online and PDF Training Slideshows. Absolutely! A great benefit of CoCoRaHS is that it provides real science activities for the classroom in public, private, and home schools. Over the last several years CoCoRaHS staff has worked with science teachers to develop a series of lesson plans and activities. These lesson plans are available for a variety of grade levels and are built around CoCoRaHS’s emphasis on measuring precipitation. CoCoRaHS also has lesson plans and activities developed for the 4-H Program that are aligned with National Science Education Standards (NSES) for grades K-4, 5-8 and 9-12. Visit CoCoRaHS for Schools to learn how your school or program can join. Please take a moment to share this post and tell a friend or neighbor about CoCoRaHS exciting grassroots effort of citizens measuring precipitation in their own backyards. Again, it’s easy to join, takes only 5 minutes a day and your observations give scientists an ever clearer picture of where and how much precipitation falls throughout our communities. Learn more about CoCoRaHS at www.cocorahs.org and follow them on their blog, Facebook and Twitter and get involved! We have shared some storm chasing videos and photos by the talented and Emmy Award winning Mike Olbinski over the years in our enews and on social media. Olbinski’s storm time-lapse and fine art work has been published nationally and internationally, seen in Arizona Highways magazines, weather calendars, movies, documentaries, commercials and television shows. Mike is based out of Arizona (our old stomping grounds for almost 20 years) so we truly appreciate his ability to capture the annual monsoon. For those of you who have never been in the southwestern U.S. desert, monsoon runs from June 15th through September 30th and it produces some awesome cloud formations, spectacular lightning shows, massive dust storms (a.k.a. haboobs), flash floods and more. Mr. Olbinski explains his latest video masterpiece, Monsoon IV, was compiled from footage taken during his 13,000 miles of chasing across Arizona during this summer’s 2017 monsoon, as well as a few places in bordering California and New Mexico. Mike shot over 110,000 frames of time-lapse and says likely only half of it ended up in the final cut. He also says the music in this video is all custom, thanks to the amazing work of Peter Nanasi. Watch Mike’s incredible Monsoon IV video below and see more of Olbinski’s videos on Vimeo and follow him on his Storm blog, Twitter, Facebook and Instagram. Monsoon IV (4K) from Mike Olbinski on Vimeo. Most states across the U.S. set aside a week in February or March to observe their own local Severe Weather Awareness week , but NOAA, FEMA and others will be promoting National Severe Weather Preparedness Week March 2-8, 2014. As we’ve seen year after year, March brings all kinds of wild weather and chaos like thunderstorms, tornadoes, high winds and flooding. And there are still chances of snow storms and hard freezes in various parts of the country so we all need to be prepared for Mother Nature’s mood swings. The goal of National Severe Weather Preparedness Week is to inform the public about severe weather hazards and provide knowledge which can be used to prepare and take action. These actions can be used to save lives anywhere – at home, in schools, and in the workplace before extreme weather strikes. As NOAA says… Be a Force of Nature by knowing your risk, taking action and being an example where you live. In 2013, there were seven weather and climate disaster events with losses exceeding $1 billion each across the United States according to NOAA’s National Climatic Data Center. These events included five severe weather and tornado events, a major flood event, and the western drought/heat wave. Overall, these events killed 109 people and had significant economic effects on the areas impacted. Globally, losses from natural catastrophes in 2013 were somewhat moderate: the direct overall losses of around US$125bn remained below the average of the past ten years (US$184bn) according to Munich Re. Sadly, in a total of 880 major disasters around the world in 2013, more than 20,000 people were killed, but this figure is significantly below the average of the past ten years (106,000). NOAA and FEMA’s Be a Force of Nature: Take the Next Step campaign encourages the public to take a single preparedness action during each day of National Severe Weather Preparedness Week. In addition to the below educational resources, visit NOAA’s online toolkit page to find some materials, social media tools, a poster and more to help spread the word during National Severe Weather Preparedness Week. March 16 – 22, 2014 is National Flood Awareness week intended to highlight some of the many ways floods can occur, the hazards associated with floods, and what you can do to save life and property. Visit www.nws.noaa.gov/floodsafety/ orwww.nws.noaa.gov/floodsafety/floodsafe.shtml to find tools, tips, brochures, videos and more. Or visit your state or local Emergency Management, Health, Fire, Police or Sheriff department’s website to find local emergency information, safety tips and tools to help you and your loved ones prepare for severe weather outbreaks. 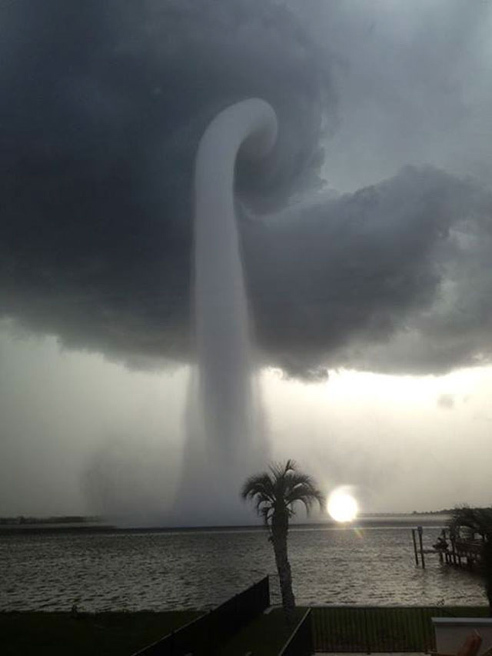 Last week we saw a photo of an incredible waterspout near Tampa Bay Florida (included below) and thought this would be a great topic for today’s Friday Fotos post. 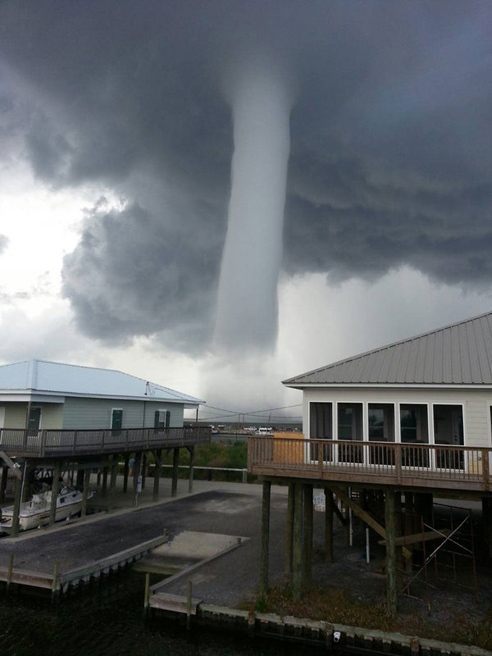 Waterspouts are spinning columns of rising moist air that typically form over warm water. The Atlantic Ocean off the coast of Florida is arguably the most active area in the world for waterspouts, with hundreds forming each year. Some people speculate that waterspouts are responsible for some of the losses recorded in the Bermuda Triangle per NASA. 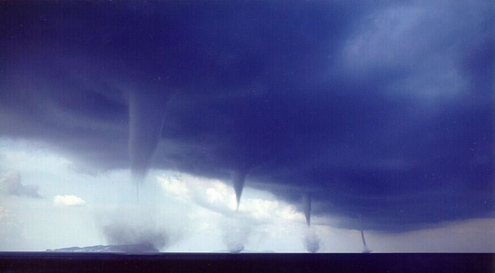 Tornadic waterspouts are tornadoes that form over water, or move from land to water. They have the same characteristics as a land tornado, are associated with severe thunderstorms, and are often accompanied by high winds and seas, large hail, and frequent dangerous lightning. Fair weather waterspouts usually form along the dark flat base of a line of developing cumulus clouds. This type of waterspout is generally not associated with thunderstorms. 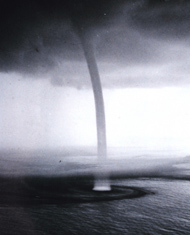 While tornadic waterspouts develop downward in a thunderstorm, a fair weather waterspout develops on the surface of the water and works its way upward. By the time the funnel is visible, a fair weather waterspout is near maturity. If a waterspout moves onshore in the U.S., the National Weather Service issues a tornado warning, as some of them can cause significant damage and injuries to people. 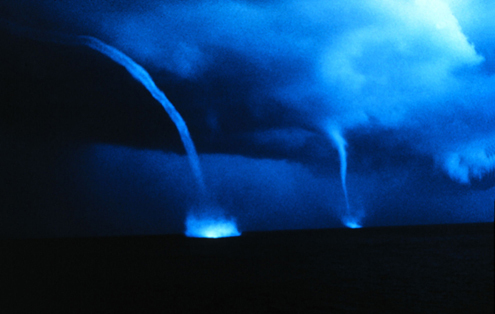 Typically, fair weather waterspouts dissipate rapidly when they make landfall, and rarely go far inland. Below video shows a series of powerful waterspouts near New South Wales coast. Several powerful columns of swirling air could be seen blasting along the water’s surface near the coastline. Australia’s Channel 7 claimed the spouts reached heights of up to 600 metres (nearly two thousand feet), but dissipated as they neared land. 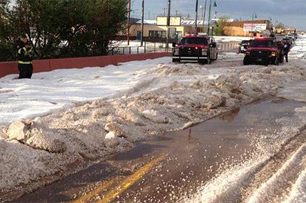 The Weather Channel reports a lone thunderstorm dumped over a foot of hail in the town of Santa Rosa, New Mexico last Wednesday evening (July 3, 2013), leaving a surreal sight the day before the Fourth of July. Photos from the Santa Rosa Fire Department showed snow plows clearing city streets clogged with accumulated hail drifts. According to the National Weather Service in Albuquerque, hail up to golfball size pelted the city around 6:00 p.m. MDT. Although this sounds strange, accumulating hail is not uncommon in the High Plains according to TWC. 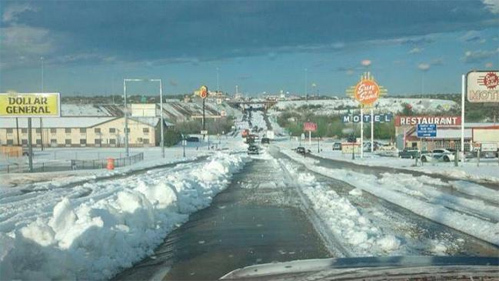 Northeast New Mexico sits in what meteorologists call “Hail Alley“, a swath from southeast Wyoming and northeast Colorado to northeast New Mexico and the Texas Panhandle, where large hail falls on average at least three days a year. And, considering much of the country is sweltering with intense heat, we thought this might be a “cool” set of Friday Fotos to share. 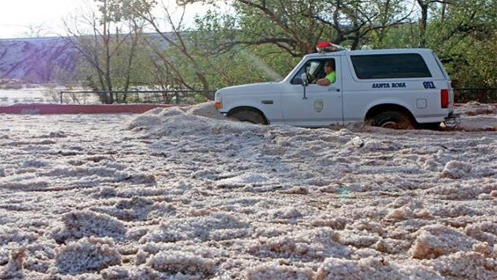 April 11, 2012 (Dumas, TX): The volume of both hail and rain overwhelmed a shallow gully, or draw, near the U.S. 287 bridge, piling the water and ice mass into massive drifts up to 10 feet high, trapping vehicles and forcing closure of the road for 12 hours. August 14, 2004 (Clayton, NM): Up to 16-foot hail glaciers. Some ice cover lasted almost a month…even in late summer! 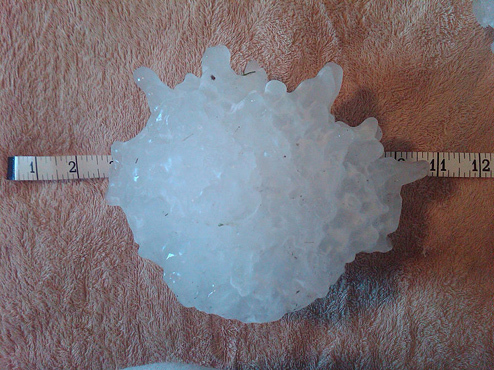 We also found a short video by TWC’s Dr Greg Forbes explaining how thunderstorms produce hail. 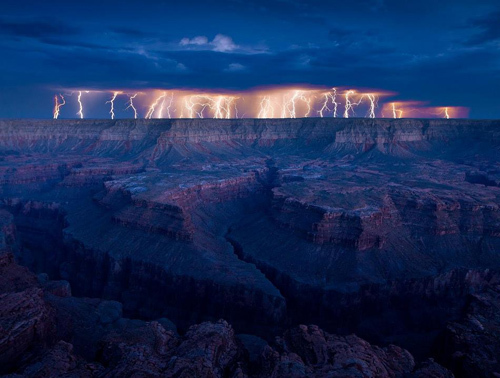 Since Lightning Safety week is winding down, we wanted to share some absolutely stunning lightning Friday Fotos. Also please take a moment to read Monday’s Lightning safety tips post … and we included a few links at the bottom with more cool photos and a spectacular lightning strike video. Enjoy! 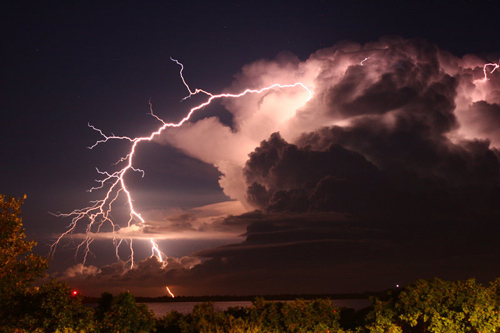 At any given moment, there are almost 2,000 thunderstorms occurring over the Earth. 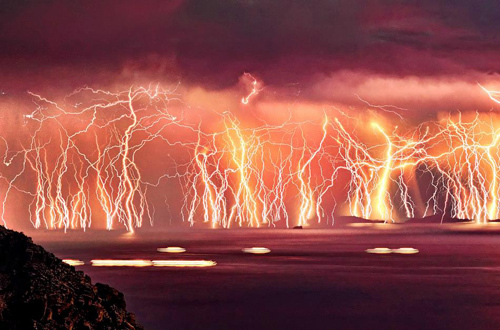 It is estimated that 100 lightning flashes occur each second somewhere on the planet, adding up to nearly 8 million lightning flashes per day. 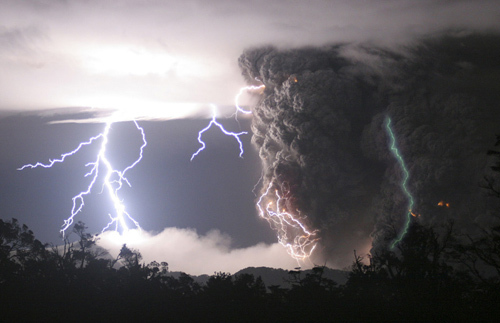 Lightning occurs most frequently during thunderstorms, but has also been observed during volcanic eruptions, extremely intense forest fires, and surface nuclear detonations according to NOAA. NWS’s Lightning Science page explains lightning is a giant spark of electricity in the atmosphere or between the atmosphere and the ground. 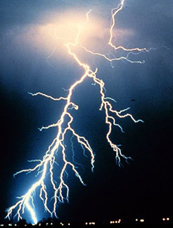 In the initial stages of development, air acts as an insulator between the positive and negative charges in the cloud and between the cloud and the ground; however, when the differences in charges becomes too great, this insulating capacity of the air breaks down and there is a rapid discharge of electricity that we know as lightning. …lightning often strikes the same place repeatedly, especially if it’s a tall, pointy, isolated object?! For example, the Empire State Building is hit nearly 100 times a year. 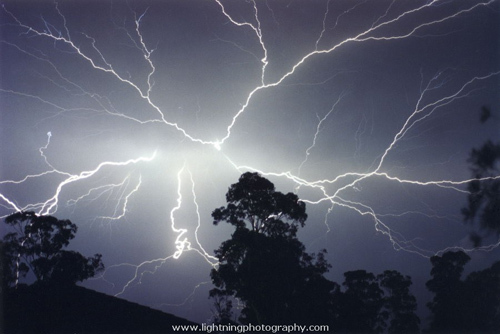 …the U.S. gets an estimated 25 million lightning flashes each year?! 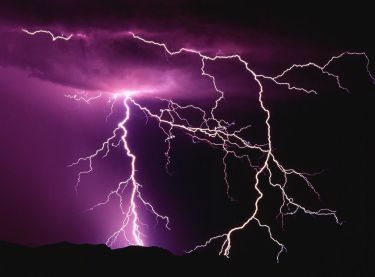 …lightning can travel 60 miles or more, often extending up to 10 miles away from the cloud that formed it?! Generally, however, a bolt travels 10 miles or less. …most cars are safe from lightning, but it is the metal roof and metal sides that protect you, NOT the rubber tires. Remember, convertibles, motorcycles, bicycles, open-shelled outdoor recreational vehicles and cars with fiberglass shells offer no protection from lightning. A lightning protection system does not prevent lightning from striking but does create a direct path for lightning to follow. 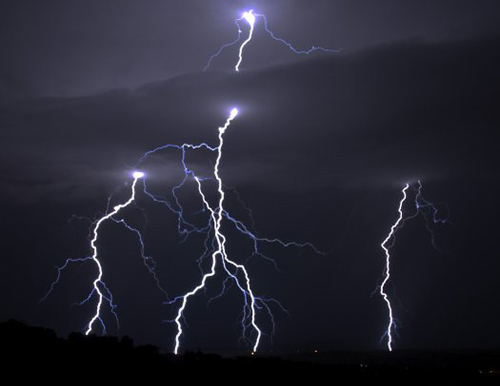 Basically, a lightning protection system consists of air terminals (lightning rods) and associated fittings connected by heavy cables to grounding equipment. This provides a path for lightning current to travel safely to the ground. Listen & watch – If you hear thunder, you’re close enough to be struck by lightning – take cover as quickly as possible. Be aware that lightning often strikes miles away from the rainfall or thunderstorm cloud. Hairy sign – If you feel your hair stand on end and feel tingly (which means lightning is about to strike)… crouch down, get on the balls of your feet and bend forward putting hands on your knees (BE SMALL). And do NOT lie flat on ground since that makes you a bigger target! Unplug it – Before thunderstorms, unplug appliances if possible – even ones on a surge protector and it’s best to move plugs away from outlets. IF INDOORS – Don’t shower – sounds weird, but wait since lightning travels easily through metal pipes and water can carry an electrical charge. Also avoid corded objects – corded phones, PCs or a mouse conduct electricity (could shock you). Cordless and cell phones or wireless devices are usually safe. IF OUTDOORS – Try to get to safe shelter quickly. 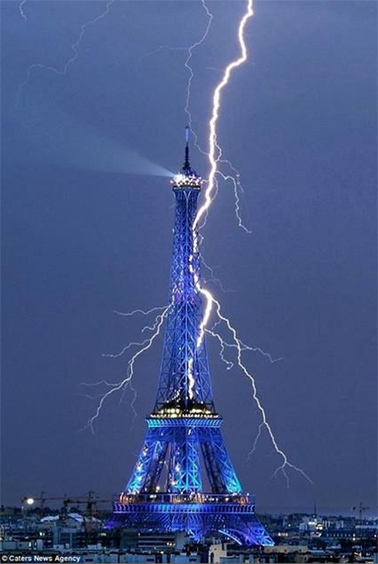 Move away from tall things (trees, towers, fences or power lines) and metal things (umbrellas, motorcycles or bicycles, wire fences, etc) since they all attract lightning. If surrounded by trees, take shelter under the shorter trees. Get to a low lying area but watch out for flash floods. IF IN A BOAT – Get to land and to shelter quickly! Water is extremely dangerous when there’s lightning. If you are caught in the boat, crouch down in the center away from metal hardware. IF IN A VEHICLE – Keep windows closed and stay out of a convertible, if possible (mainly since you may the highest target if lightning strikes). Victim does not carry electrical charge – they CAN be touched. Call 9-1-1 or local EMS (emergency) telephone number. Check ABCs ( Airway, Breathing, & Circulation) … if victim is passed out – you may need to do Rescue Breathing or CPR. Victim will have 2 wounds – an entrance and an exit burn. DO NOT try to cool the burn with anything. Cover burn with a dry sterile bandage or clean cloth. Seek medical attention, if necessary. Above safety tips extracted from our IT’S A DISASTER! book – download more topics and learn about our funding ideas .